ZTE Corporation announced its new 5G, Internet of Things (IoT), smart home, smart education, big video and terminal services at the China Mobile Global Partners Conference 2017 (CMGPC 17). ZTE, in collaboration with China Mobile, focused on six major 5G services at this event: 5G Interoperability Development Testing (IODT), 5G connected cars, 5G Unmanned Aerial Vehicles (UAV), 5G Wireless Access, 5G submarine, and 5G VR cloud games. The CMGPC 17 industrial conference which has been hosted for four years, leads the trend of China’s information industry and global ICT industry, building a global digital ecosystem. ZTE, China Mobile, and Qualcomm Technologies jointly performed the world's first 3GPP R15-based end-to-end 5G NR system IoDT test. The test uses ZTE's 5G NR pre-commercial base stations and Qualcomm Technologies’ 5G NR UE prototype. The IoDT test was conducted in China Mobile 5G Innovation Center Lab, and was broadcast live on the conference. 5G NR is essential to meeting the increasing demand for data connection. In the future, it can support a brand-new mobile broadband experience (such as HD video streaming, and immersive Virtual/Augmented Reality), and provide entirely new services with both high reliability and low latency (such as self-driving cars, UAVs, and industrial control). A 5G experience car allows users to watch 5G live programs and enjoy 5G high-bandwidth VR videos in a high-speed moving scenario, and view test data of the 5G network in real time, such as the rate, wireless coverage, throughput, mobility, and delay. Users can see and feel the true "5G speed". At the event, ZTE showed two-way interactive live broadcasting between the booth and a 5G experience car in the Guangzhou Higher Education Mega Center (HEMC). It is China's first 5G pre-commercial field trial being constructed by ZTE and China Mobile. Owing to the high reliability, ultra-low latency, and ultra-high bandwidth of 5G networks, a 5G UAV can smoothly transmit HD images to the cloud without any damage to picture quality, and generate topographic maps in a few seconds, greatly improving the efficiency of terrain survey and mapping. In addition, 5G UAVs break the bottleneck of distance and therefore can effectively guarantee the communication of UAV-based logistics and disaster relief in the future 5G era. Through 5G networks, FWA can rapidly and intactly transmit ultra HD images captured by hundred megapixel–level cameras. In case of emergency, it can accurately and quickly capture images, and even realize facial recognition. A 5G network can provide an ultra-high bandwidth of 500 M for hundred megapixel–level cameras with an ultra-low delay (just a few milliseconds). The 5G autonomous submarine simulates the scenario where marine researchers observe sea creatures with the VR technology over a 5G network, conduct scientific investigations and stop the leakage of oil pipelines by remotely controlling underwater vehicles, demonstrating the potential of 5G in industrial control, scientific research, rescue, and disaster relief. ZTE has constantly partnered with China Mobile in the 2G, 3G, and 4G eras. In 2016, it became a partner of the China Mobile 5G Innovation Center, and its Pre5G Massive MIMO was used in China Mobile's networks. In June 2017, China Mobile and ZTE performed a joint test on the China's first 5G pre-commercial site in the HEMC. In the approaching 5G era, the partnership will be further deepened. 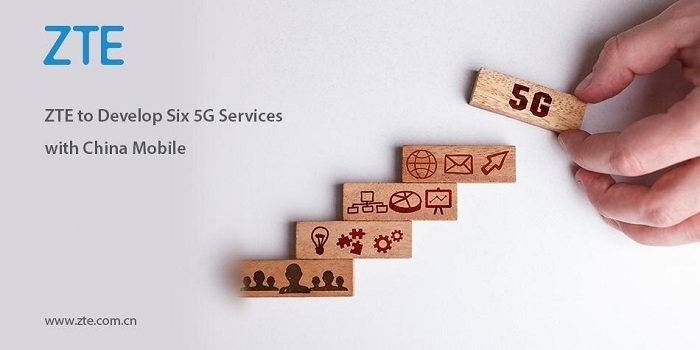 As a 5G pioneer, the company has built strong partnerships with major operators, such as China Mobile, China Telecom, China Unicom, Wind Tre (Italy), Orange (France), SoftBank (Japan), Telefonica (Spain), Telenet (Belgium), and KT (South Korea). It expects to continue work with these partners to conduct 5G tests, accelerate the global 5G commercial use, and provide users with unprecedented 5G experience.